The Whole Ensemble, originally uploaded by herm007. The ensemble, that is, that was thrown together with an old pillowcase, sharpies and fabric markers, glue gun, old scrub brush, and cardboard ... in about 90 minutes while the boys napped before going out to trick-or-treat. It lasted all of 5 minutes, while I fixed Douglas' costume, and then was taken off and pinned to the back of the backpack that he rode in the rest of the night. 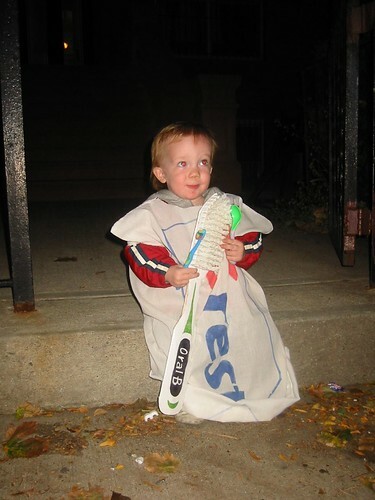 Somehow he didn't get as attached to the giant toothbrush as he is to his small one, which goes everywhere with him. I should buy them by the dozen, they get lost as often as pacifiers used to with Douglas. The highlight of the walk was the "hallowe'en house" that is just a couple blocks down from us, and puts on an ever-more-elaborate show every year. This one spanned 3 yards, had a giant flying saucer that delivered Intergalactic Department of Sanitation workers who collected garbage and then proceeded to use a giant recycling machine two yards over to turn it into candy, which was delivered by conveyor belt to the hordes. Hordes they were, with police barricades, chants of "we want a show!" and mayhem everywhere. Not bad for a homegrown effort.